The Heart Rate Monitor sample application demonstrates how you can measure the user's current heart rate. The following figure illustrates the main screens of the Heart Rate Monitor. 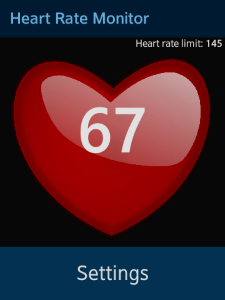 The application opens with the main screen that shows the heart rate being measured. After the measurement is complete, the current heart rate is displayed. The heart image in the background is animated to beat in sync with the measured heart rate. The application continues to measure the heart rate and update the heart rate value and animation accordingly. If the application cannot measure the heart rate, an information screen is shown after 10 seconds. Use a slider to define a limit you want monitor, and click OK. The defined limit is shown in the top right corner of the main screen, under the header. If the measured heart rate exceeds the limit, the application background turns red and the device starts vibrating for 20 seconds. The vibration happens in 1-second bursts separated by 1-second pauses. Device must have a heart rate sensor, or you must use the Emulator. config.xml This file contains the application configuration. images/ This directory contains the images used to create the application UI. js/core This directory contains the application framework. js/core/core.js This file contains the functions for defining modules. js/helpers/vibration.js This file contains the helper functions for starting and stopping device vibration. js/models/heartRate.js This file contains the module for managing the heart rate sensor. js/views/init.js This file contains the functions responsible for the view of the application, and the back key and low battery handling. js/views/main.js This file contains the functions for handling the application behavior. js/views/page/init.js This file defines the application UI and handles the interaction with the user. lib/tau This directory contains the TAU library files. Main screen shows the current heart rate. The screen layout consists of a header section with the application name, a content section with <div> elements for displaying the current heart rate, defined limit, measuring time, and the heart image, and a footer section with the Settings button. The screen also has a setting-popup popup element used to define the limit. The views/main.js file defines the screen behavior. Information screen shows an instruction if the application cannot measure the heart rate. Try again. Clean the sensor, then attach Gear snugly to top or under side of wrist, not against the bone. Be still and quiet. heartRateData represents the heart rate monitor data. It contains a rate numeric field that contains the current heart rate value. heartRate is a reference to the heart rate sensor. Define the start() method, which starts reading data from the sensor. The init() method from the main module calls the start() method during the main module initialization. When the application terminates (after the user presses the back key on the main screen), the back key event handler calls the stop() method in the heart rate module. The stop() method stops the sensor and unregisters the previously registered listener. The heart rate module exports methods for setting and getting the limit value from the storage. The storage writing and reading operations are asynchronous, and the event module from the Core framework calls callbacks when the operations are completed. The events are handled by the onWriteLimit() and onReadLimit() callback methods. These methods trigger the models.heartRate.setLimit and models.heartRate.getLimit events to notify the view that the operations are completed. 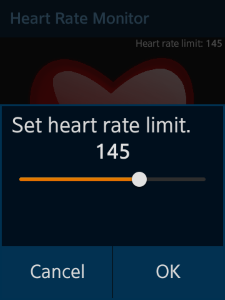 When the heart rate exceeds the defined limit, the application background changes and the device vibrates. Use the bindEvents() method to register the event listeners for when the user sets a new limit. The asynchronous heartRate.setLimit() method stores the new limit value and fires the models.heartRate.setLimit() event. Implement and register the models.heartRate.setLimit listener. The OnSetLimit() method calls the asynchronous heartRate.getLimit() method, which fires the models.heartRategsetLimit event. The setLimitExceeded() method checks whether the current heart rate is higher than the set limit. If the limit is lower than the measured heart rate, the main screen gets a new CSS style class which changes its background color to red and the device starts to vibrate. Otherwise, the CSS style class is removed. The default duration of 1 animation of 2 heart beats lasts 1.5 seconds. 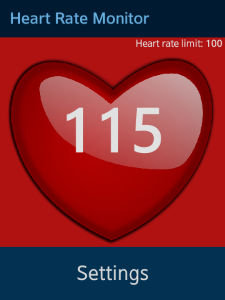 When the heart rate changes, 120 is divided by the current heart rate and rounded to one digit after the decimal place to determine the new duration.